Every day, Taylor asks her mother if the mail has arrived. Taylor is only 3, but knows that once a month a special package arrives in the mail in a big blue and white envelope, addressed to her. It’s her PJ Library book, a free book she receives as a gift from the international award winning program intended to strengthen the identities of Jewish families and their relationship with the Jewish community. PJ Library was started in 2005 in Massachusetts by Jewish entrepreneur, Harold Grinspoon and was piloted by UJA Federation in York Region in 2010. Since then, over 2000 young families from the region have enjoyed free, Jewish themed books and music. Now the program is expanding to include Toronto and Peel Region, bringing subscribership in our community up to over 4000 families. Funded by UJA Federation of Greater Toronto, Centre for Jewish Education’s WOW! 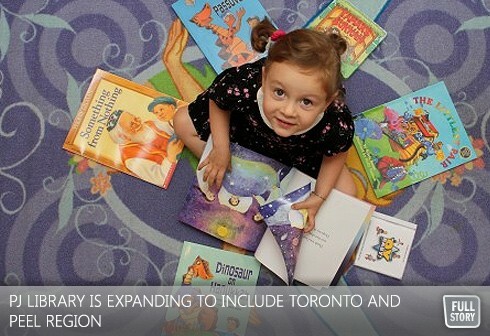 Toronto Initiative and local philanthropists, with matching funding from the Harold Grinspoon Foundation, PJ Library Toronto joins over 180 other PJ Library communities in North America. One of PJ Library’s goals is that somewhere between Dr. Seuss and the Berenstein Bears, a parent and child can turn to a book like Vivian Newman’s “Ella’s Trip to Israel” or Toronto’s own Aubrey Davis’ “Bagels from Benny” sparking a Jewish conversation. “We love the Jewish content and built-in "teachable" moments,” says Jacqueline Fine, a York Region mother who has been receiving the books for some time. Communities recognize PJ Library as a proven way to attract and engage young families. The books, chosen by a selection committee of educators and editors, run the gamut from explicitly Jewish to barely so. Registered families with children 6 months to 5 ½ years old receive one book on CD per month. All the books include a parent’s guide for further discussion or activity. Themes like sharing, tzedakah, love of Israel and acts of loving kindness as well Jewish holiday are all represented in PJ Library books. These concepts are reinforced by special programming and holiday celebrations throughout the year. A special Chanukah concert, featuring well known children’s performers Judy & David, is being planned in November to celebrate the expansion. Registration for PJ Library is free and is open to families with children 6 months to 5½ years with at least one Jewish parent living in Toronto, Peel Region or York Region. For more information on PJ Library and how to register please visit www.pjlibraryToronto.ca.